More photos: several views of the ship model and closer views of details. Click on the photos for high resolution pictures! Launched in 1637, the SOVEREIGN OF THE SEAS was larger and more powerful than any other ship of her time. Her crew were up to 800 men, and her 102 guns could fire devastating broadsides. In 1634, Charles I had asked the great English shipbuilder Phineas Pett to build of a great new ship as part of his overall effort to improve and expand England’s navy. Built at a cost of £65,586 – about ten 40-gun ships could have been built for the same amount – the SOVEREIGN OF THE SEAS was intended as an instrument of propaganda as well as war. She was the Royal Navy’s most lavishly ornamented vessel. In 1660 she was rebuilt and renamed Royal Sovereign. During the three Anglo-Dutch Wars, she saw action at the Battle of Ketish Knock in 1652, Orfordness (1666), Solebay (1672), Schoonveld (1673), and the battle of Texel (1673). Following another rebuild in 1685, in the War of the League of Augsburg, she was at the battle of Beachy Head (1690) and the battles of Barfleur and La Hogue (1692). In 1696 a misplaced candle set the ship on fire and she burned at Chatham. 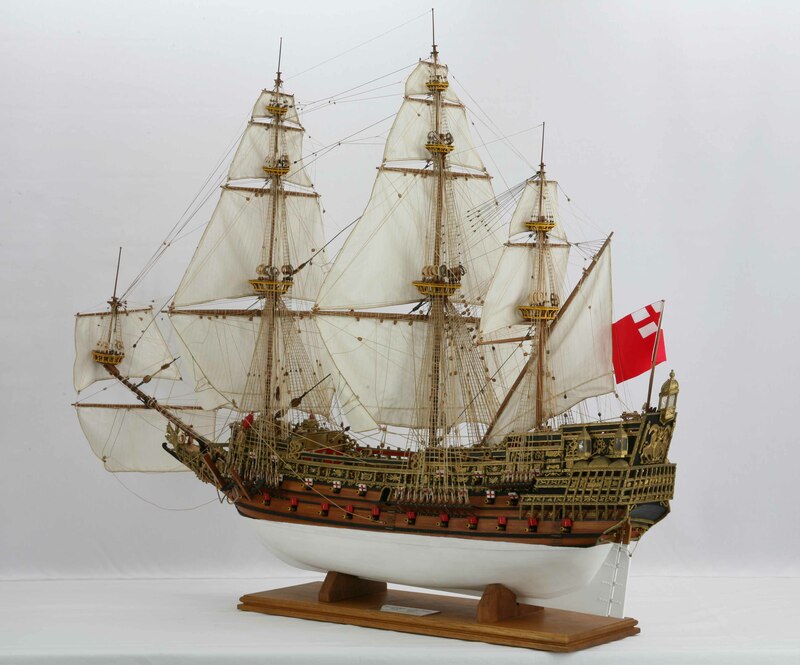 This model of the SOVEREIGN OF THE SEAS was made in 1990. It has been restored with love and care. The ship is a beautiful piece of work. The rigging and hull are impressive, and the many details show the art of shipbuilding at that time. The model's sails are set as running downwind on port tack. The model is fixed to the stand board by two screws. It is 1 : 78 scale. Length is 109 cm, width 41 cm, height 93 cm. Have a look at the set of photos. There are several views of the entire ship model and the hull before a blue background and closer views of hull, deck and rigging. Click images to enlarge!